In 2018, with our treasury full of the most rare essences, being guided by our devotion to uncompromising luxury and audacity, George Papahatzis founded in Athens JOURNAPER PERFUMES. For the very first time, Greece has its own fine perfume making company, the only one internationally which revives ancient Greek perfume making, revealed through the work of Theophrastos, Aristotle and Hippocrates. Nothing is rushed in our lab. True to our values, every perfume is handmade, from its synthesis, to the wooden bottles, the massif lids and the packaging. Each perfume is 100% unisex, as it is our firm belief that perfumes know no discrimination. Currently our perfume collection has 10 perfumes totally. Five including ‘ ( VARONOS, NYCHTA, OROSSIMO, AITHRIA, EROS IROS) and four from the “Dare to live it” line (ROYAL POUDRE, GREEK SUMMERS, AUDACIOUS, LOVE ON FIRE). The line home creation has won the market as well, with long lasting, luxurious, aromatic candles, sticks and room sprays, called PYR and Mania. They promise to capture your senses with extraordinary syntheses and high end packaging. Driven by innovation, elitist elegance, audacity and ‘Your perfume your strength’ as our motto, we initiate perfume aficionados to newly found experiences, never setting boundaries to inspiration or precious raw materials. We encounter precious moments from ancient times to the future, from the Far East to the West. We aspire to share them with you! The Goddess Aphrodite is the logo. The Goddess of love, and fertility, but also beauty, the one making sure that perfume making was an essential supplement both for Gods and mere mortals for irresistible looks. She is our inspiration and JOURNAPER PERFUMES logo. Graphic designer Fotini Lagou). The aromas of beautification and cleanliness were an essential part of ancient Greeks’ daily routine. So, sparkled by JOURNAPER aromatic universe, George Papahatzis emphatically states about “his” Goddess Aphrodite. “ She is not simply the Goddess of beauty and pleasure. She is not just my astrological sign planet (Libra). She is the timeless symbol, the untamed lure, the protector, the dame who treasures the most important Elements, the one who ravishes Gods and mortals alike. The impersonation of beauty and lust. 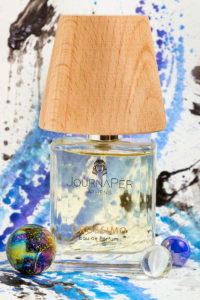 That is, every aroma emerging from our JOURNAPER perfume lab! Our delicate bottles are a hymn to harmony and plain luxury. They all weigh 50 ml so as to always accompany you. 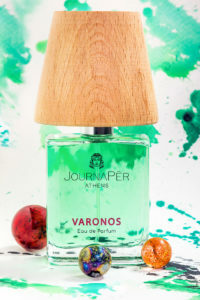 Their benchmark being their massif wooden lids, handmade one by one, from European wood, complying with sustainable management laws, and abiding to the ultimate JOURNAPER PERFUME LAB quality. 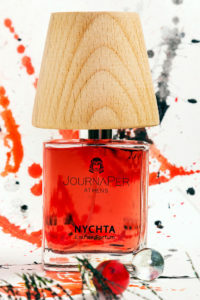 The creator’s two great passions, journalism and perfume making, harmoniously coexist bottled in a vial. Thus journaper lab pays a tribute to antiquity, unconditional luxury, nature, eternity and lure! Do not hesitate to entrust perfumer George Papahatzis with the essences of the most beautiful memories of a lifetime, and your most precious perfumes and join us in the creation of your own unique perfume bearing your own name on the valuable bottle! JOURNAPER receives orders for candles, room sprays, even perfumes (for gift boxes)for boutiques, concept stores, e-shops, spa and hotels.